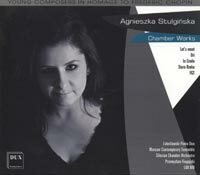 Description: Stulginska's music, like that of a number of the latest generation of Polish composers, draws freely on the rich legacy of the sonorist Polish avant garde from previous decades, placing this multiplicity of technical resources - from prepared instruments, extended playing techniques and various systems of tuning and subdivisions of the octave, to aleatory, electronics and unorthodox instrumental combinations, all of which make an appearance on this disc - at the disposal of very directly emotional, accessible meanings and messages. So, for example, Let's meet employs two very heavily prepared pianos and a great deal of alternative playing, but the result is an uncomplicatedly affable dialogue between the two protagonists. Ori is a depiction of organic processes in a continuous stream of interwoven sounds, which sounds like a synthesized tape piece with no readily identifiable instruments, but is not. The creaks and noises of the first part of In Credo are clearly an instrumental depiction of the hubbub of a crowd assembling for a religious ritual, called to prayer by a gong-stroke and inwardly meditative thereafter. "Old River" pays tribute to Lutoslawski, in a flow of diverse instrumental sounds and textures that combine to clearly narrative or pictorial effect. The Flying Garbage Truck seems to be transporting its freight of electronic detritus, assembled from found and synthesized sources, in a busy mechanism of instrumental texture.